Come on in and recommend! OR…. It’s kinda like a low-tech YELP review for books! Hey MHMS Kids, Check this Out! 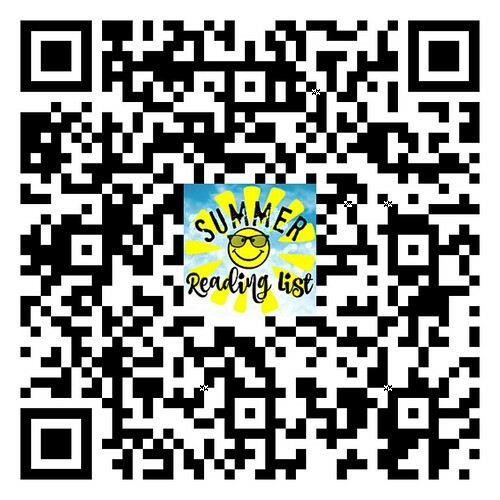 This is a cool reading promotion that’s all about you! Come on into the Library Media Center and find a book you’ve read and liked. Even better, find a book you LOVED! Like you could even maybe read it again kind of love. Go to the display pictured…. 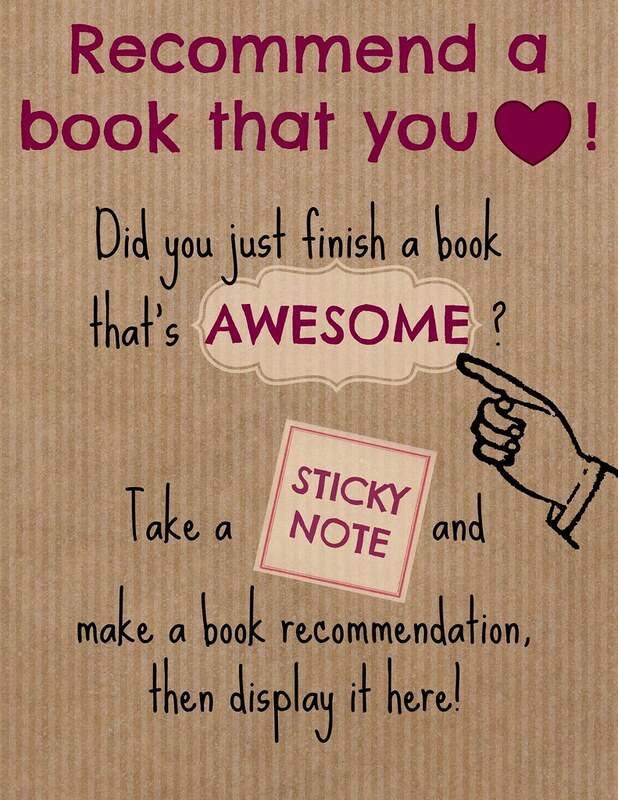 How To: Grab a sticky note and write on the clipboard your book recommendation. 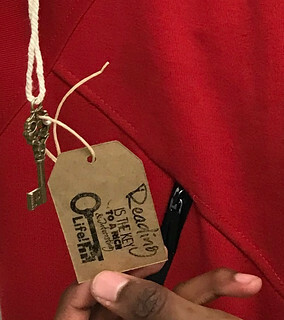 You can sign your first name & your grade or just something like “an 8th grader”….I just want to make sure that the other kids reading YOUR note know that it was written by a fellow teen. 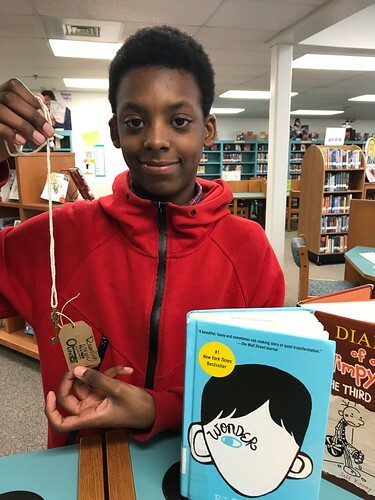 Leave that book on the shelf, if there’s not enough room, just prop it up or find me or Ms. Bell to help you and feel the warm happy feeling you helped another kid read find a great book! This book was really: Funny, Scary, Romantic, Adventurous, Mysterious, Thrilling, Intense….basically insert any adjective that fits here! Peel off the post it and stick it on the cover and as my Dad would say…. Hi there! If you landed here & are a Teacher, or Librarian, or a Teacher Librarian or Media Specialist or a grown up — let me invite you to scoot over to my professional blog for the low down deets on this Reading promotion! 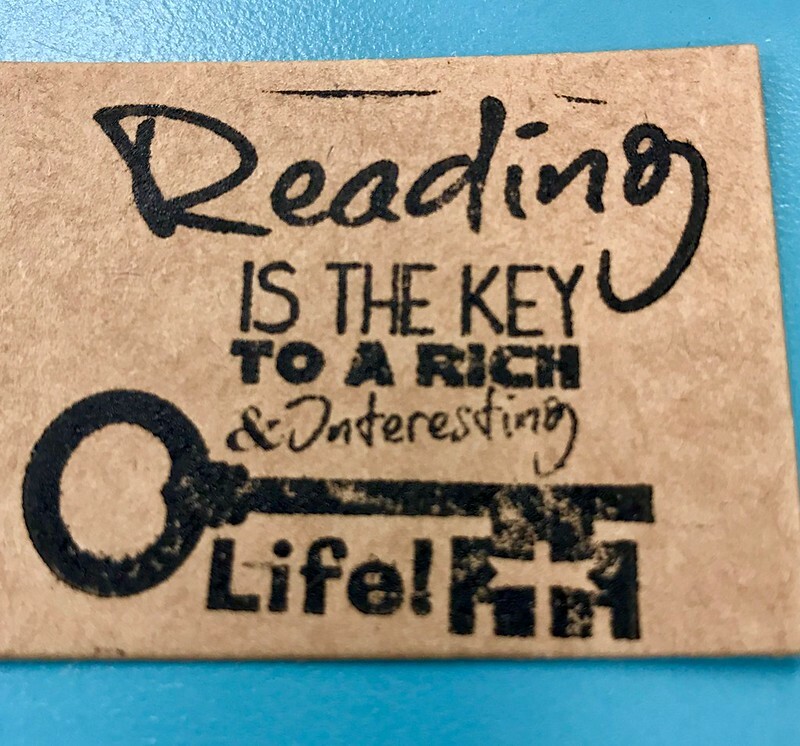 This is reading promotion idea that’s inexpensive, low-tech, includes student voice, and I totally nabbed it from the amazing Librarian Tiff five years ago and I still love it! It’s kind of what you can call an oldie but a goodie. This can work at any time in a School Library or ELA Classroom. 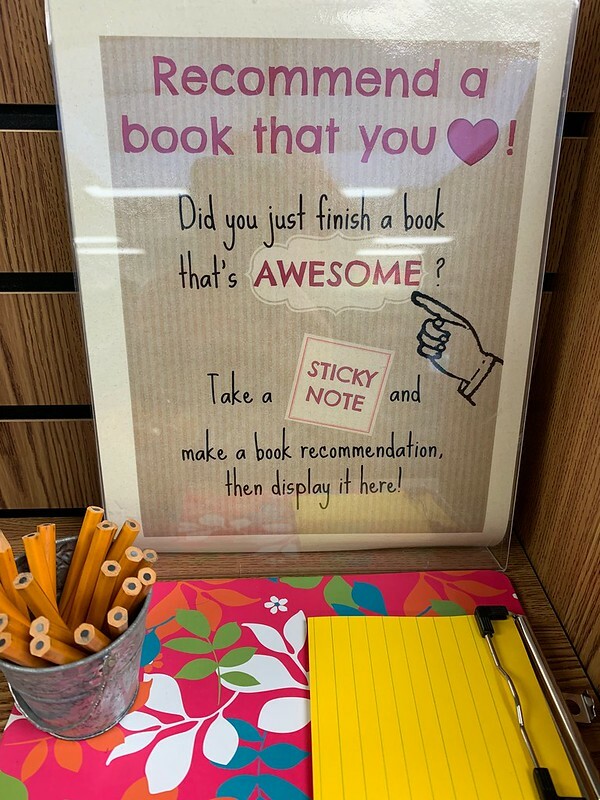 I was inspired by Librarian tiff because she also does this in her School Library and created this amazing graphic below, made it Creative Commons, and gave it out to the world! I love beautiful signage that I don’t have to make myself! Because I’m kinda (occasionally) lazy. I bought some colorful mini clipboards from Amazon & lined sticky notes. I already had the mini galvanized buckets of golf pencils – stole those from my PAC computer bank. This way kids don’t write ON THE books. Don’t judge me for being a little OCD and not wanting the pencil impressions on the front of a Library book! The kiddo can write anything. “I loved this book because…” and sign it their fist name or just “an 8th grader” etc. My kids love seeing what other kids have read. Same idea, but in a low tech way, as my #BookDropLife & Instagram posts. This way kids can recommend books to other kids and be heard. Simple. Easy. Effective. 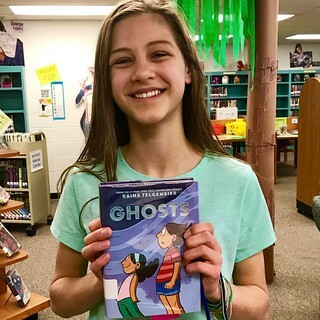 I think it’s really important to allow kids to feel like they have a voice in the Library Media Center and in our school. Participatory Librarianship. 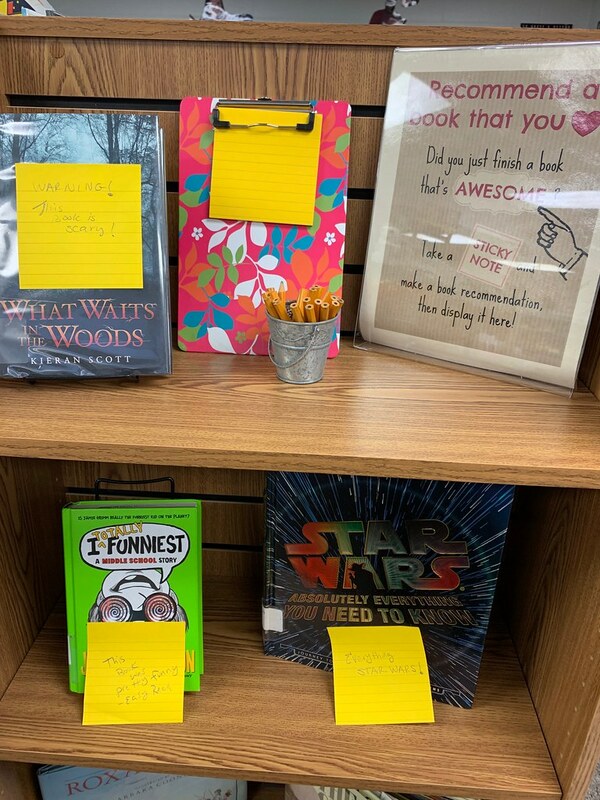 At the end of the year, when I put this display away, I always take the sticky note off the front of the book and paste it inside the front cover. So the next kid can open the cover, read the book blurb, AND the student recommendation. I was inspired to create a NEW Speed Dating notation sheet for kiddos. Feel free to make a copy & use it! of year is my VIP Key Readers. You can read more about that here…. 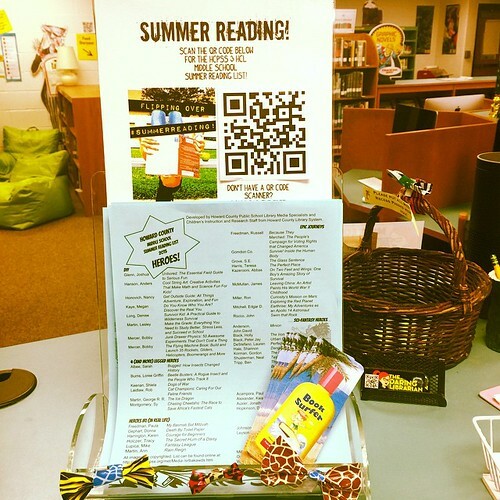 What easy & inexpensive ways do you promote reading in your School Library or Classroom? Please share in the comments, Twitter, or Instagram ways you reach out to kiddos to get them to read? 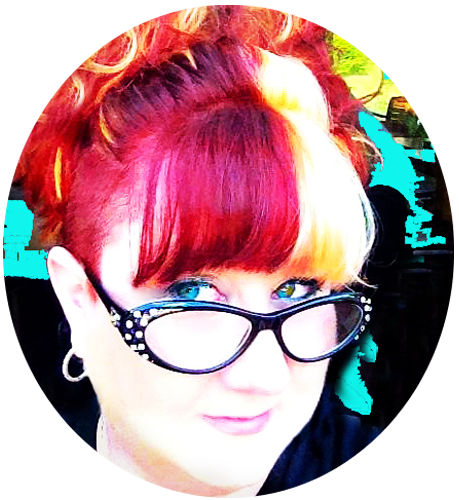 Twitter: @GwynethJones – IG: The Daring Librarian. 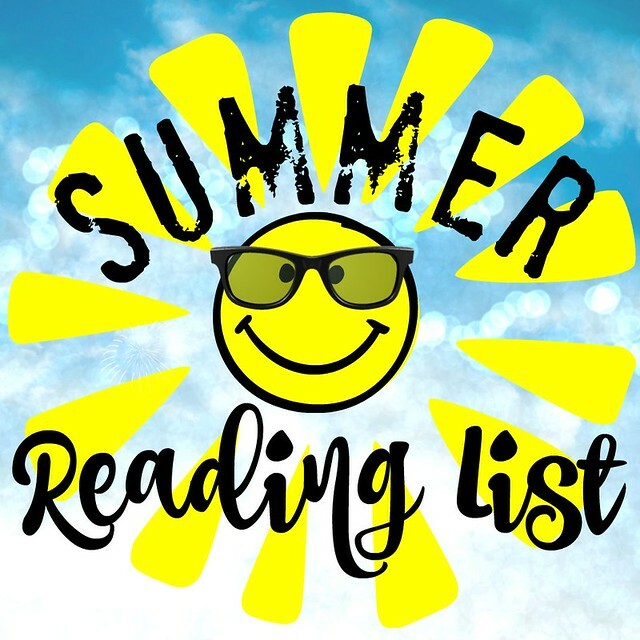 The Summer Reading List is Here! I can’t believe it’s that time of year again! Time to share our Summer Reading List with you! 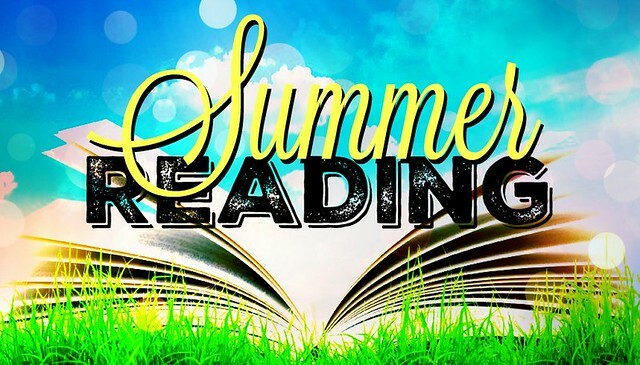 Visit our Howard County local Savage Branch Library & Hi Tech STEM Education Center this summer and FLIP over summer reading or flip over some amazing tech learning opportunities! Murray Hill kids – If you read any of these books this summer, we would LOVE to hear what you thought in the comments! 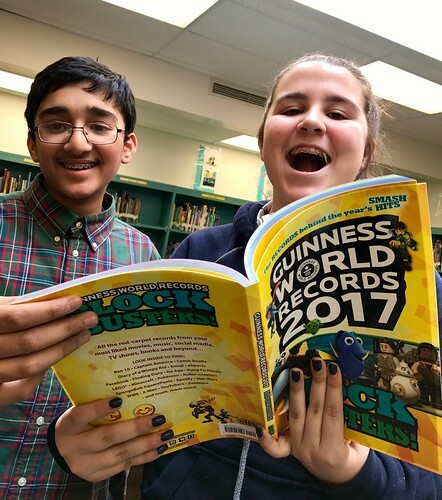 Follow us on Instagram to see pics of kids being AWESOME every day in our library and throughout the school! 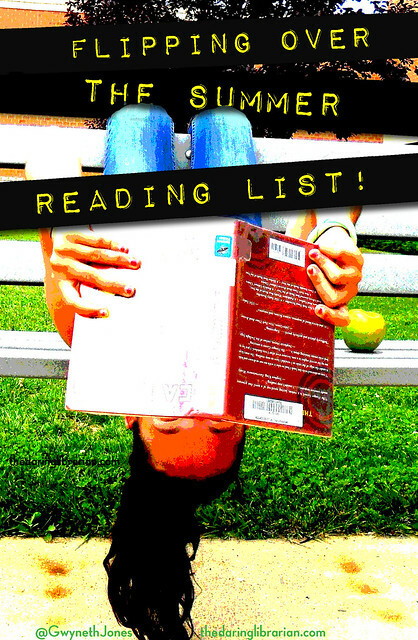 Recommended Summer Reading Lists for the Whole Family! Participate in activities, crafts, and games. Enjoy the music of live bands: School of Rock House Band and Charm City Junction. Activities include Kindness Rocks, crafts for children; and Rock Band for teens. 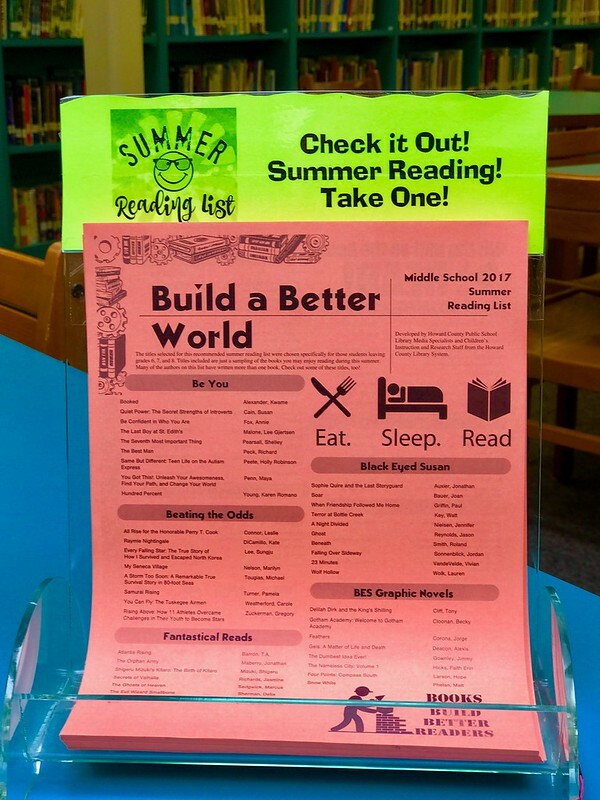 The fun continues all summer, when you enroll in Summer Reading: Libraries Rock! Sign up for a free account at hclibrary.beanstack.org, or pick up a booklet at any branch. Then log the books you read and mark off activities as you complete them for chances to win prizes. Do you ever get stuck clicking around Amazon buying random stuff you may not really need but suddenly desire? Do you have a mountain of Amazon boxes in your kitchen waiting for each recycle day? Yeah, me neither! [cough] But sometimes I stumble across something that sparks my creativity and I’m like – SO COOL!….Now what can I do with it? 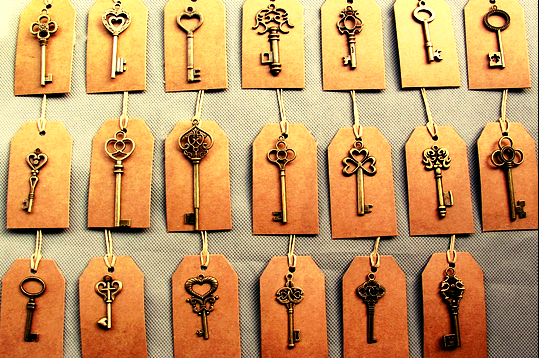 This was the case with a set of 100 antique style keys I found that came with raffia cords & brown card stock tags that I thought would be a cool component of a reading promotion campaign! 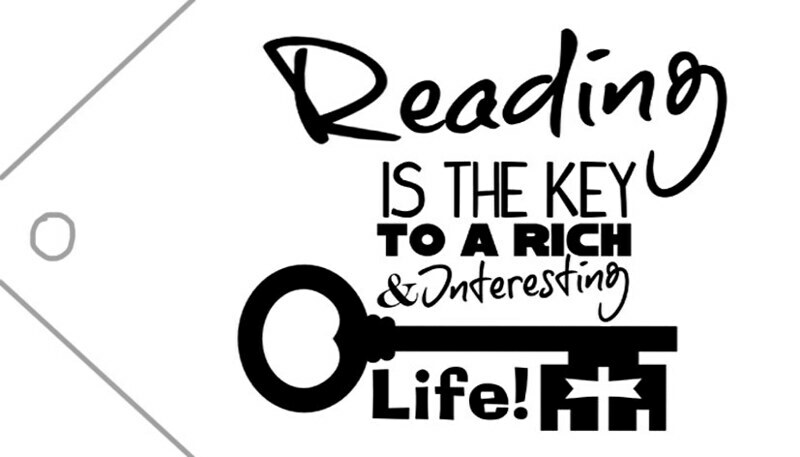 Reading is the Key to a Rich & Interesting Life! 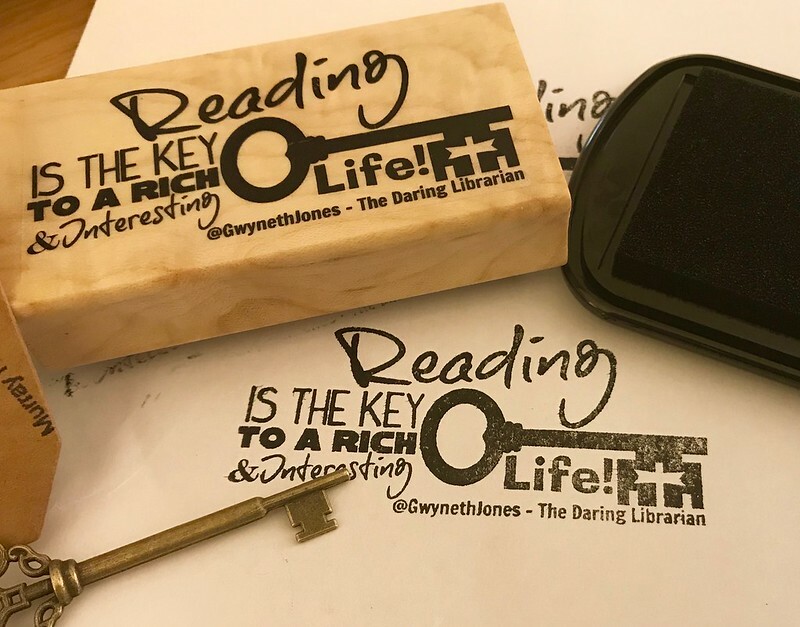 If you’re an English or Reading Teacher or a School Librarian please head on over to my professional blog, The Daring Librarian, for buying information, more how-to’s, and FREE Downloadables! 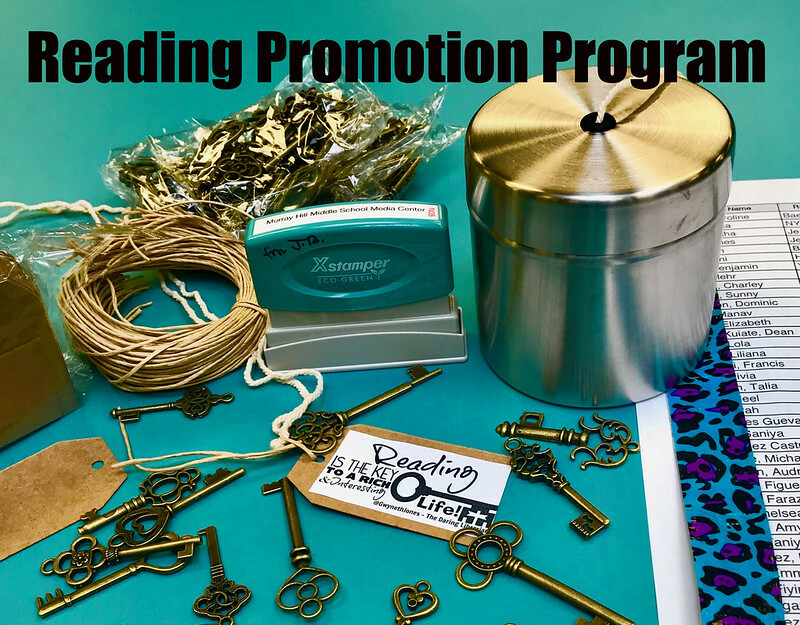 Generating a list of the top 100 readers in my school and letting each kid pick out their preferred special key, I’m presenting it to them one by one including the key on a soft twine for wearing around the neck and a specially stamped commemorative card! I’m also taking pictures and posting them on Instagram & Twitter of each of our Key Readers! Miss Caroline leads the pack having read over 100 books this year! And still going through them about a book every other day! I’m also posting pics of the kids with their keys on Instagram and Twitter. Here’s my friend Mr. Ben who is one of my “frequent fliers” and avid readers. Ben is in the Top 5 having read over 70 books! I’m so proud of our ravenous readers here at Murray Hill Middle School! This is what brings us the most joy – having kids come in every day (sometimes twice a day!) gobbling up new books and enjoying them! Be kind to each other. Push the positive. Change the world. Pay it forward. Keep Praying for good. FREE eBooks for Winter Break Reading! When I first heard this, I thought it was too good to be true! I thanked her vaguely on Twitter then I thought – could I possibly share it with everyone? So, I called her to double check that I could share it with you, the world, and his wife – and she said YES! Middle school kiddos can filter by grade level. Below there’s even a letter to for parents (in English & Spanish) or students AND Bonus: a printable bookmark with login & password. Visit our Library Media Center to load up on books for the Winter Break! Take home as many as you want! (as long as you don’t have any overdue books, cause – you know – I ain’t THAT crazy!) We have many readers in our school (you know who you are!) who can read a book a day — ok, sometimes even more! We want to make sure you’ve got great stuff to enjoy! Don’t forget to visit our lovely local Savage Branch Library, too! Letter for parents in Spanish! 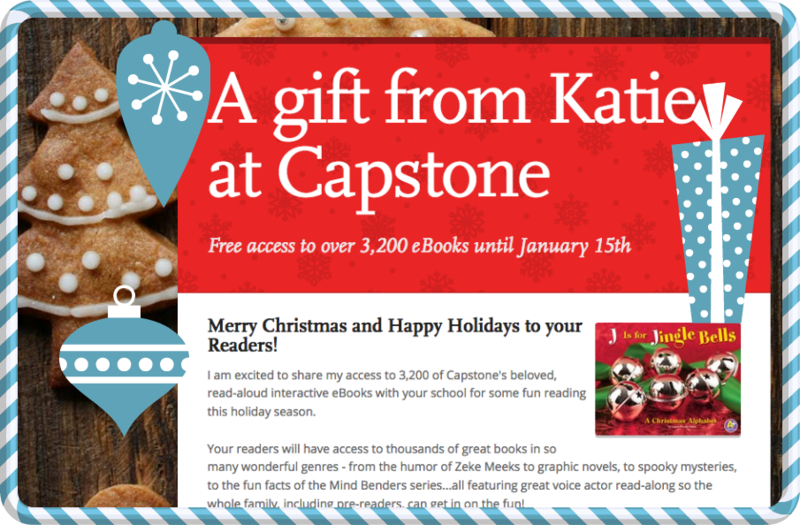 Why not Tweet a Thank you to Katie & Capstone for this generous gift to all our reading families!? That would be Awesome! 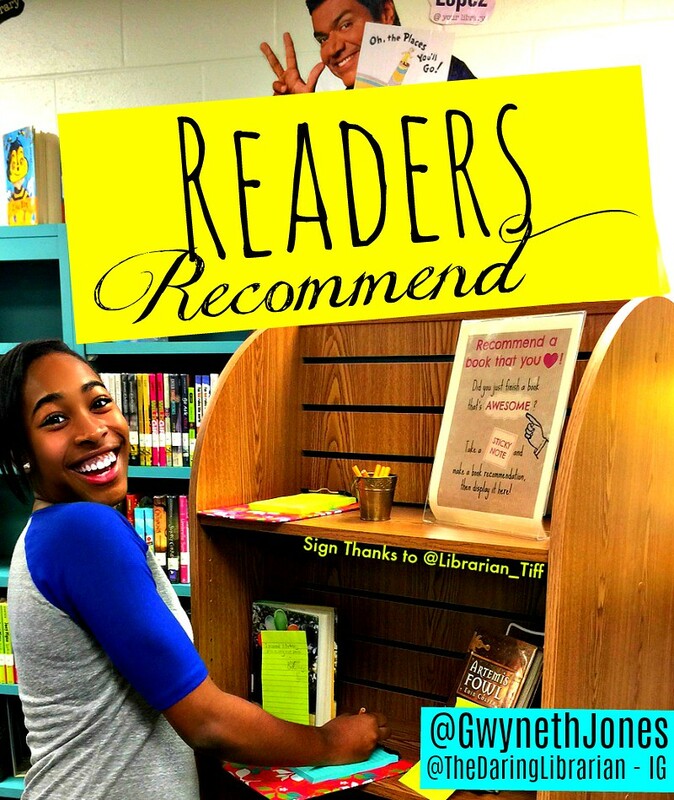 Please say you heard it from @GwynethJones the Daring Librarian! Maybe if we show our gratitude enough, we’ll get even more FREE trials! W00t! Who doesn’t like FREE? “Can I Take a Shelfie of You? Is something I ask quite a bit at the MHMS Daring School Library. The easiest way to share on Instagram is taking the humble shelfie. 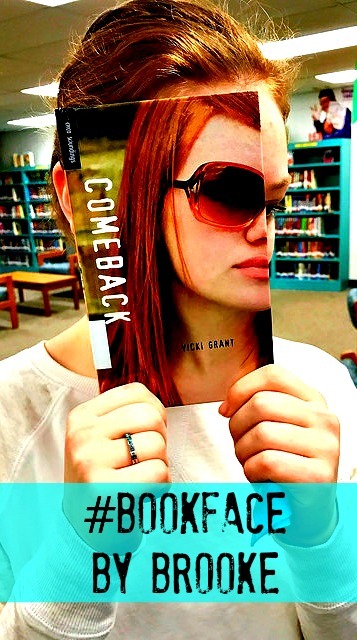 Like a selfie, but with a book? 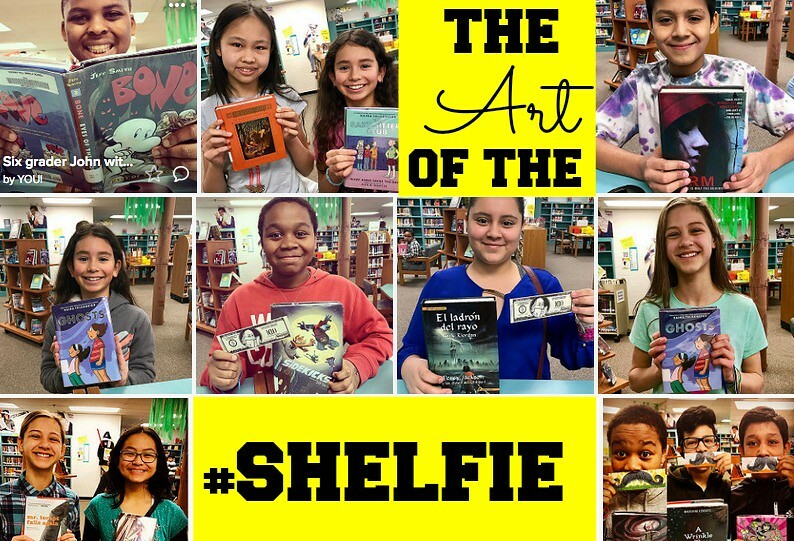 Asking teens and patrons to hold up the book they just checked out or are returning are called shelfies. OK….it’s kinda a stretch…but as I mentioned in an article I wrote last year for the YALSA (Young Adult Library Services Association – a branch of the ALA) blog last year, it’s just one positive quick, fun, and easy way to promote reading, literacy, books, and community using social media. Kids like to see what other kids are reading. I always ask if they want to take a shelfie, and I never give any guilt trips if they’re too shy or would prefer not to. But most of my teens love to show off their latest book, and even tag themselves in the picture! 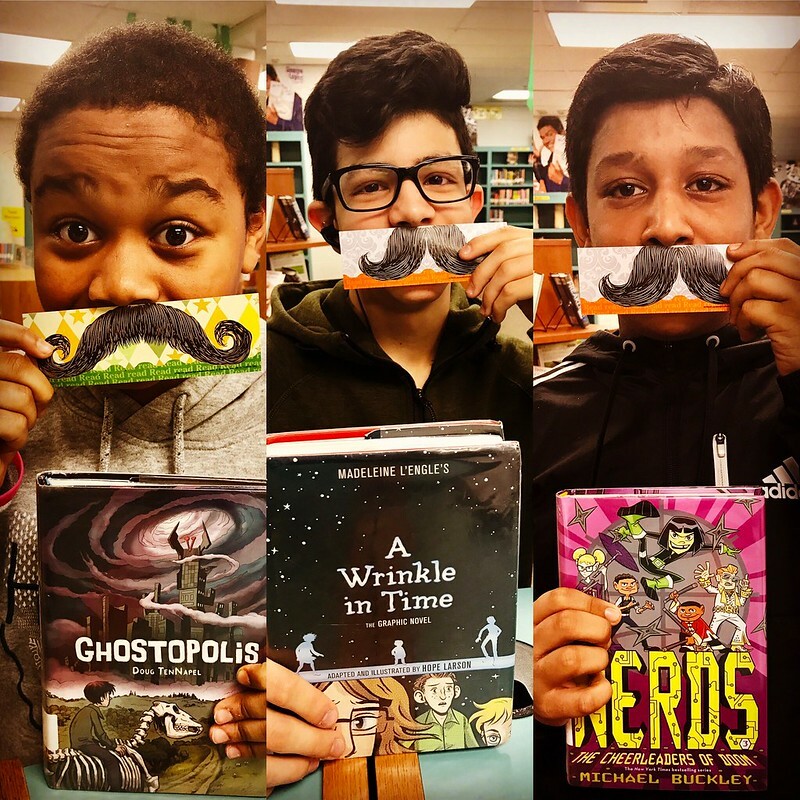 Holding up a mustache bookmark is just a bonus. I mustache you to believe me in this! Mr Raj #Shelfie & his @MikeLupica book! #TravelTeam 💕our readers! 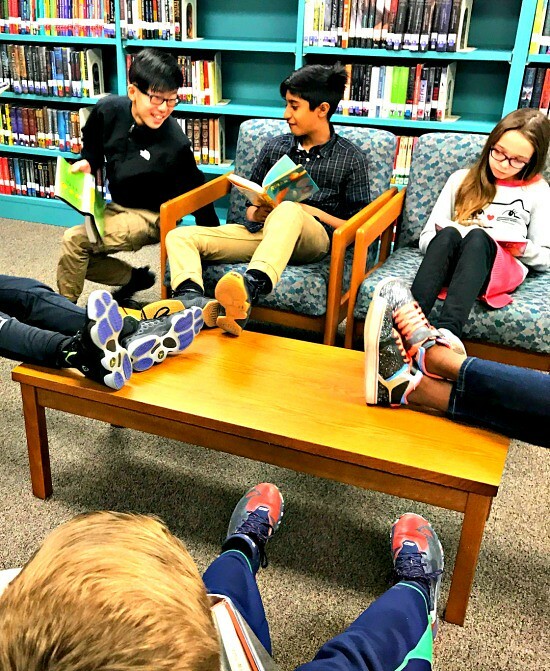 Beanbag reading at the @hcpss_mhms Daring school library media center! 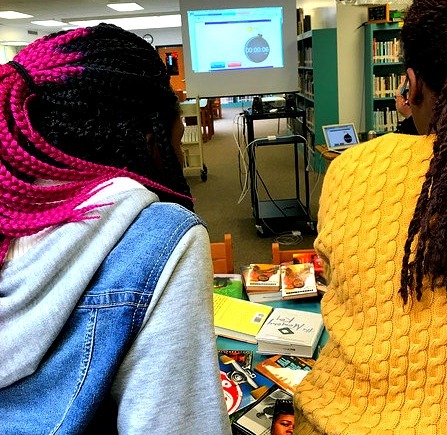 Visit our Howard County local Savage Branch Library & Hi Tech STEM Education Center this summer and FLIP over summer reading or flip over some amazing tech learning opportunities! ((Pssst! I Mustache You To Consider This Challenge! 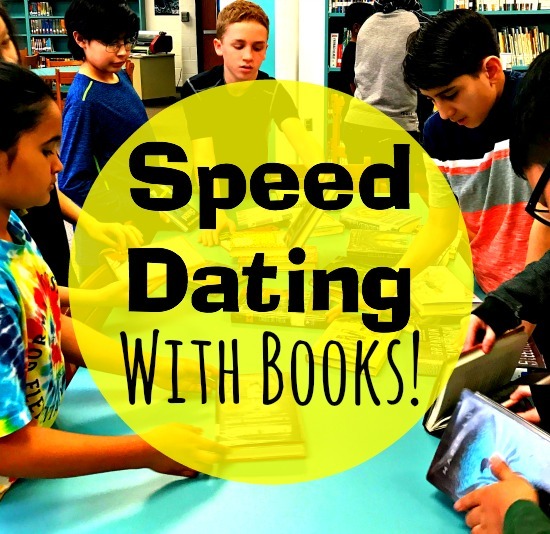 I want to share with you a favorite book selection activity that I did with the kiddos here at MHMS dig around Valentines Day, it’s super silly and fun, creates a lot of excitement, and makes the books fly out of the library! I first blogged about this with you back in 2013, added a genre twist last year, and now I’ve added a video and a few new tweaks! With my middle school kids this activity is guaranteed to make them grin, giggle, and cringe a little. Give yourself permission to really ham it up. Because prepare yourselves, book lovahs, this is super cheezy! If you’re an English, Reading, or School Librarian who would like to do this activity, click on over to TheDaringLibrarian blog for all the resources! View ALL the Reading Lists on our HCPSS Media Homepage! Visit our local library the Savage Branch & Hi Tech STEM Education Center this summer and FLIP over summer reading or flip over some amazing tech learning opportunities! Celebrating the Freedom to Read! 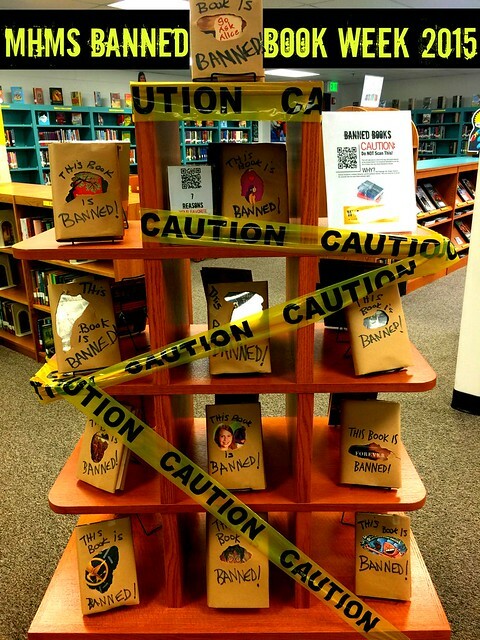 MHMS Celebrates National Banned Book Week with a display highlighting some of the books that have been banned throughout the years in American school and public libraries. 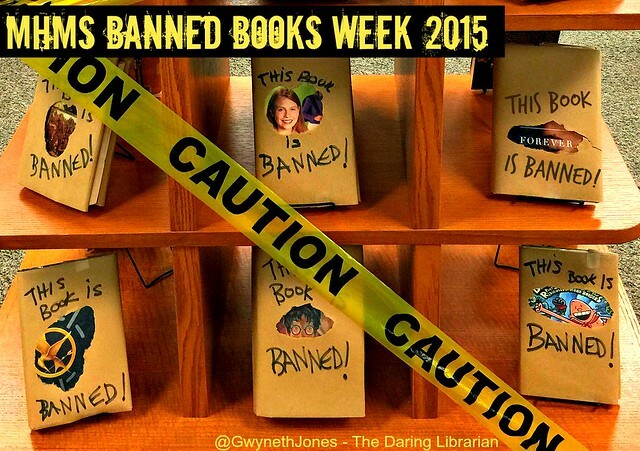 “Banned Books Week is the national book community’s annual celebration of the freedom to read. Hundreds of libraries and bookstores around the country draw attention to the problem of censorship by mounting displays of challenged books and hosting a variety of events. The 2015 celebration will be held September 27-October 3. To celebrate banned book week here at MHMS we created a book display covering up some of the most banned books with strategic tear outs. 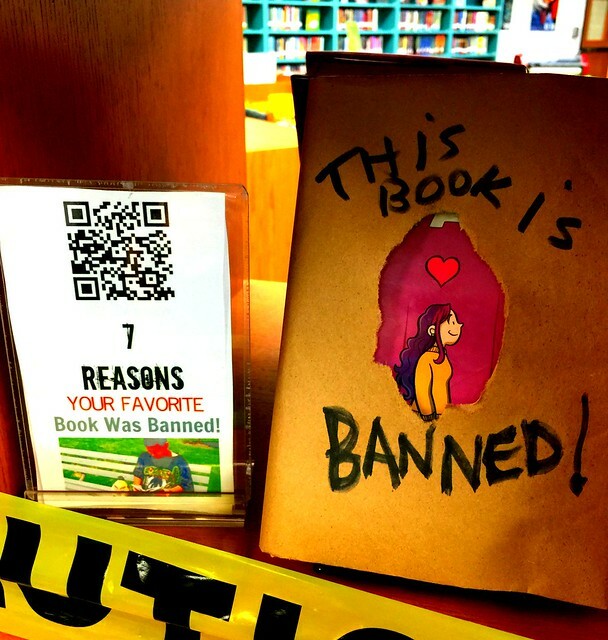 We also created a couple QR Code resources for kiddos to learn more about Banned Books! 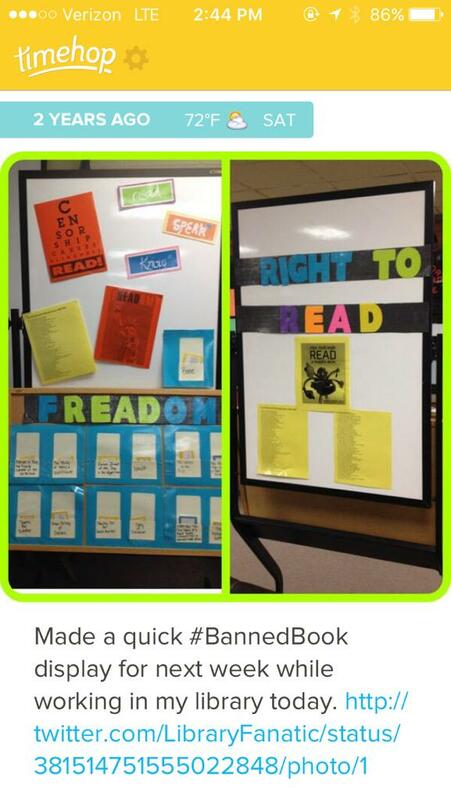 We here at the MHMS Daring School Library believe in the freedom to read without censorship! Middle school is a WONDERFUL but quirky time for kids with wide ranges of maturity and reading levels. (and that’s why I teach middle school – because, LOVE IT!) But, I must admit, there are a few books that we have that I consider maybe to be more 7th or 8th grade in subject matter than right 6th graders. That’s when I sometimes exercise my judgement as a certified school librarian to say to a 6th grader – this may be too mature for you, wait till next year. But I wouldn’t EVER want to take that book off the shelf and not let a kid “grow into it” nor do I approve of forcing a kid to read a book. It’s all about the Freedom of Choice! 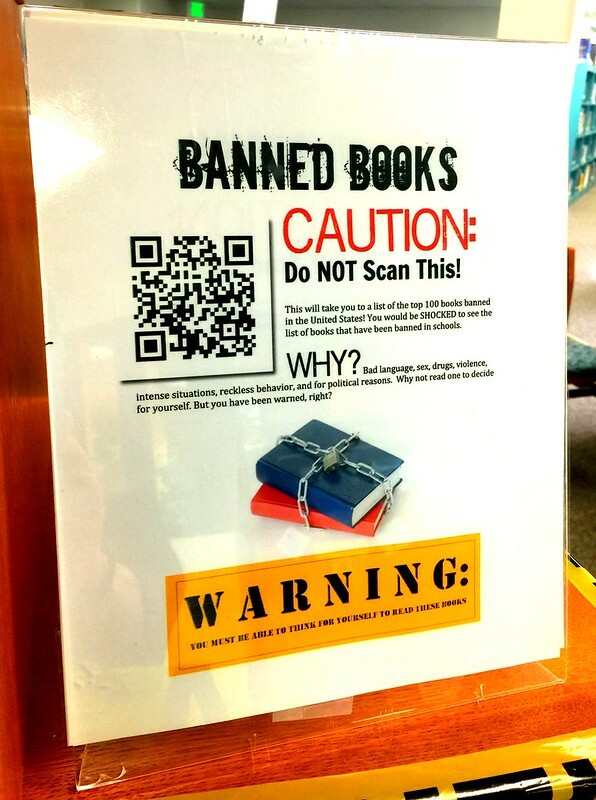 Read more about Banned Book Week! 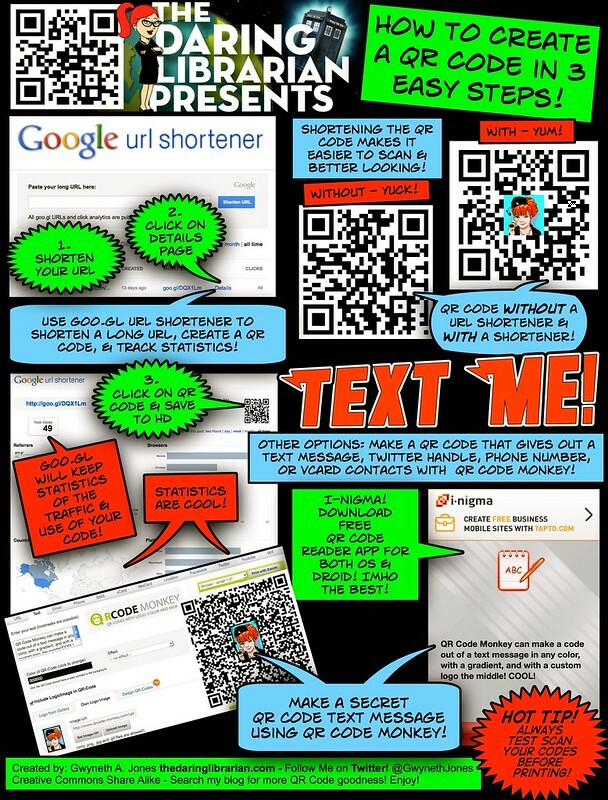 How to Make a QR Code in 3 Easy Steps! 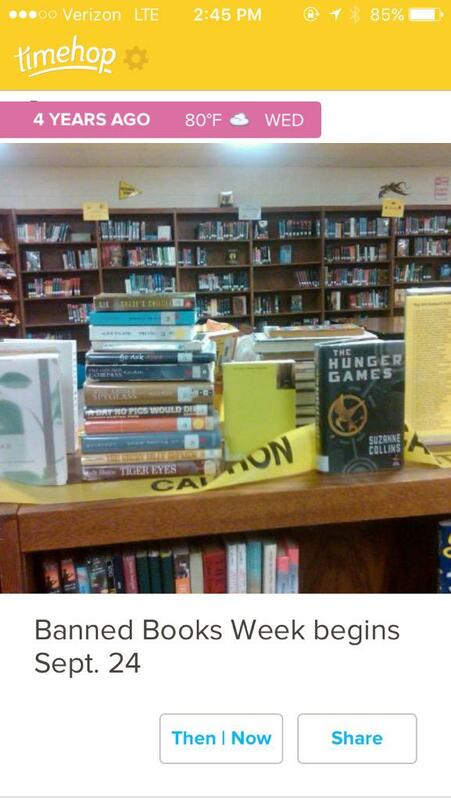 MHMS isn’t the only school library to celebrate #BannedBookWeek! Check out these Timehop pics from her friend Ms. Sherry Gick, a Teacher Librarian & Tech Specialist at Rossville Consolidated Schools in Indiana! 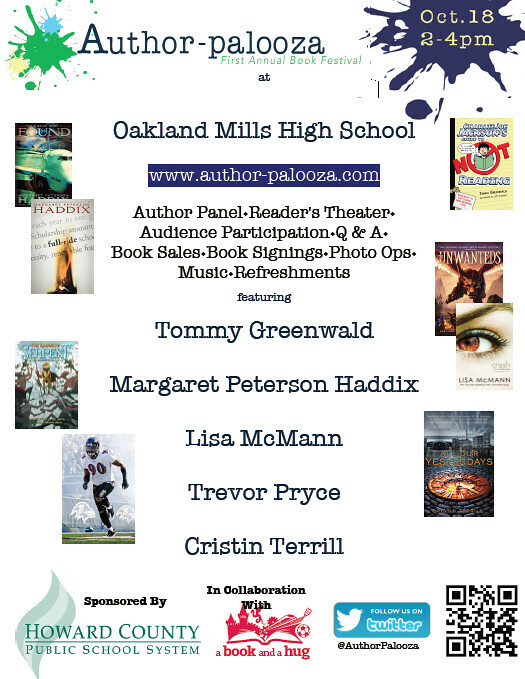 Author Palooza Comes to HoCo! at Oakland Mills High School! This is a wonderful opportunity to support our love of reading. A portion of the afternoon will include a kid-driven Question and Answer Session with the authors! Students are invited to submit questions. Their questions can be about one of the books the author has written or about how to get started as a writer. Ask your ELA teacher how to submit your questions! All student questions received by will be entered into a drawing for a Barnes and Noble $25.00 gift card. The student must be present at the event in order to ask the author his/her question. Visit the AuthorPalozza website and follow @AuthorPalooza on Twitter for more!